As I asked before what are people thoughts on this? This thread is relevant to Thailand, on topic and something a lot of visitors to Thailand should know about as most people (visiting) have know idea about the law in this regards. Fair enough...But you can buy a Buddha statue in just about any market and shop in Thailand . And its illegal for you to take it out the country. Hence my point about the usefulness of the thread. Yes it is usefull , but the Law is a bit hypocritical dont you think. I totally agree with the sentiments of the billboard .... and I am sick of seeing Buddha statues misused as a garden ornament here in Oz. But aren't Buddha houses out in the yard? As I approached the immigration official, this was the first time I was able to see with my own eyes the “no buddha tattoo” signage I had heard about before arriving. 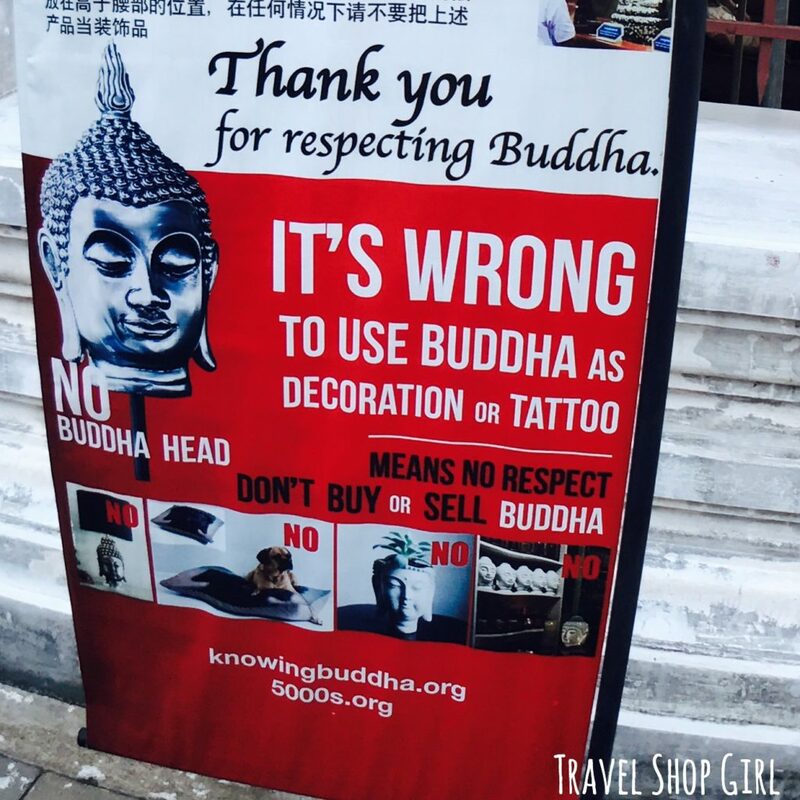 There are various forms of this sign, but it basically comes down to this: It’s wrong to buy or use buddha symbol as merchandise, decoration, tattoo, or to own buddha head. The signs are pretty much everywhere and the law was created in 2011 by the culture minister to to prevent offending Thai people. The Culture Ministry has attacked the growing trend for tourists in Phuket and other parts of Thailand to have religious images tattooed on their bodies. It has ordered provincial governors across the country, including Phuket, to crack down on such tattoos, igniting a debate on the human rights implications of forbidding the practice. Culture Minister Niphit Intharasombat told reporters on Monday that Phuket’s Culture Office had uncovered an “alarming trend”: tourists have images such as those of the Buddha, Ganesh and Jesus Christ tattooed on their arms, legs and ankles. It is culturally inappropriate and erodes respect for religion, Mr Niphit said. But the ministry is likely to face an uphill battle to end the practice. The service is highly popular and tattooists can charge extra for such work, with some jobs costing upwards of 20,000 baht. Mr Niphit downplayed the likelihood that the tattoos could be a genuine expression of spiritual belief. The tattoos were just part of a fashion trend among tourists, who most likely did not believe in the religion and were ignorant of the true significance of the image. Buddha statues have become a key element for most Buddhists around the world are reminded of his compassion, kindness and his teachings and feel the highest regard for him. Some show respect, others behave with ignorance. Last edited by Hatari; 25th November 2017 at 13:20. It's not just Thailand ..
A British tourist is to be deported from Sri Lanka because of a Buddha tattoo on her arm. Naomi Coleman was arrested as she arrived at the airport in the capital Colombo after authorities spotted the tattoo on her right arm. A police spokesman said the 37-year-old from Coventry was arrested for "hurting others' religious feelings". Ms Coleman is being held at an immigration detention camp after a magistrate ordered her deportation. The arrest and pending deportation of a 37-year-old British nurse, Naomi Coleman, from Sri Lanka for sporting a tattoo of a meditating Buddha on her right arm has once again raised the issue of tourists being woefully unaware of religious and cultural sensitivities in places they visit. .... This is how religion is practised in this part of the world. It is not necessarily extremist or politically motivated: these traditions have existed for generations, regardless of who was ruling the country. There has never been a time when Sri Lankans felt it was OK to sport the image of Buddha as a tattoo. 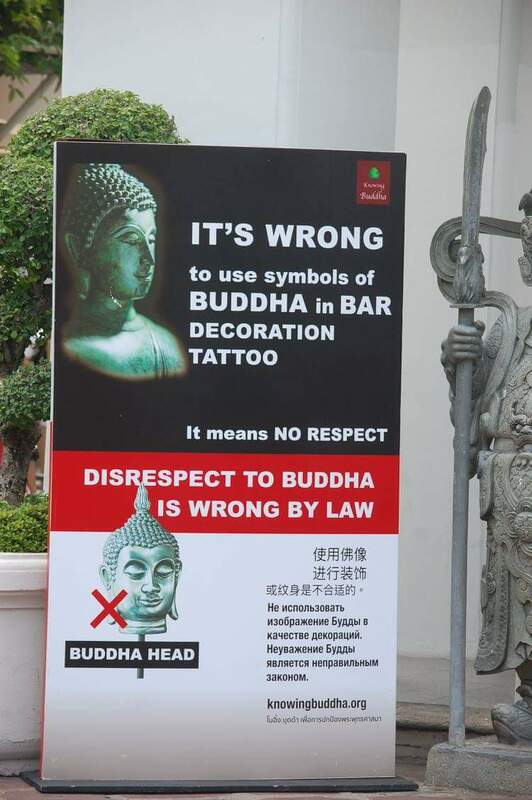 Many Sri Lankans would feel offended if they saw a Buddha tattoo, or the image of Buddha on a T-shirt or a pair of jeans, or being used as an ornament. If anything, these actions show that the tattoo bearers have not taken the time to read up on the country they are visiting and its customs. On the Foreign Office travel advice page on Sri Lanka there is no ambiguity on how the image of the Buddha should be treated. "The mistreatment of Buddhist images and artefacts is a serious offence and tourists have been convicted for this. Don't pose for photographs by standing in front of a statue of Buddha," it warns. Being aware of the customs of the country you intend to visit can save a traveler a whole load of trouble, as Coleman would attest. But I believe both would make excellent garden features, please put me down for one of your Jesus garden sprinklers, when is the Islamic range coming out? The whole issue seems to be the campaign of one woman, Apanee Wongsakon. Campaigns on giant billboards in areas with heavy tourist traffic, e.g. the gateway to Bangkok city inbound from Suvarnabhumi Airport, the Phuket International Airport, and the Chiang Mai Airport. Distributions of various print materials to cultivate and raise awareness on proper treatment of Buddhist symbols and images i.e. 5000s magazine (printed every 2 months), knowledge boards placed in key temples throughout the country, brochures. Campaigns on various medias i.e. short-film video campaigns, campaigns on social network and websites. Annual Dhamma walk campaigns to raise awareness in key touristic markets such as Jatujak weekend market, Kao-sarn road. Annual exhibitions on important auspicious Buddhist days in main tourist attractions several times a year. IMO her approach isn't following the Buddhist teachings. She is happy to have one on the house she is just afraid of "police"
Does the rule only apply to Buddha heads as stated? What about full statues of Buddha?